Limiting ourselves in this way is detrimental to our psyches, especially when we tell ourselves that we “can’t” over and over again. Said often enough, we gradually begin to internalize this message, causing our minds to become habituated to it, eventually accepting self-limitation as a “go to” method of dealing with future opportunities and problems. In other words, the repetitive messages that go on in our heads are what create our belief systems. Our beliefs, in turn, affect how we act, perform, and behave. Core beliefs form the foundation from which people form intentions, which affect every aspect of their lives. The stronger a person’s perceived self-efficacy, the higher the goals they set for themselves and the firmer their commitment to them. 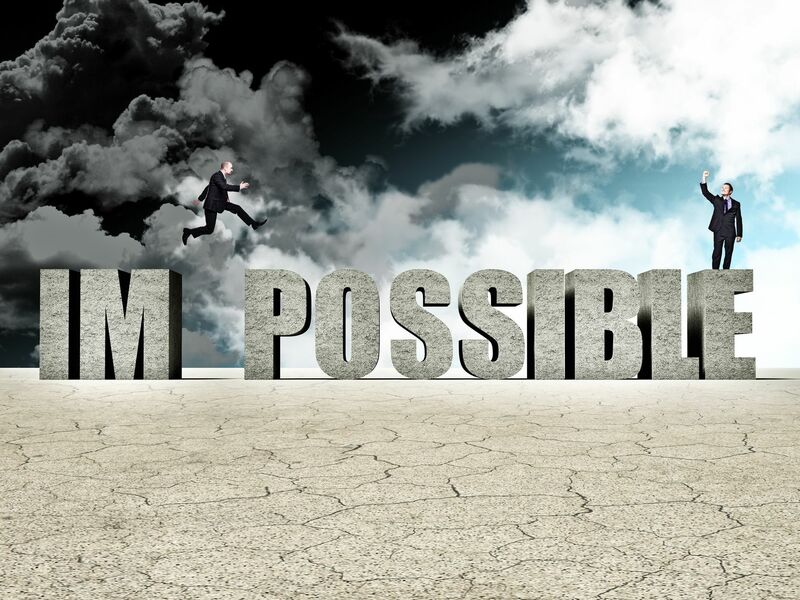 Since research indicates that human achievement and positive well-being require an optimistic sense of self-efficacy, it is worth examining the role “I can’t” plays in our lives and challenging the accuracy of “I can’t” statements. When we use the word, “can’t,” we present ourselves with the challenge of proving that a 100% impossibility exists. When we apply this logic, it will become apparent that many more things CAN be done than we think. In fact, most things can be accomplished to some degree, given the right conditions. Impermanence refers to the transient nature of the world – in other words, nothing is fixed or permanent. By the very nature of impermanence, our circumstances are always changing. This means that we live in a world of ever-unfolding potential, and therefore possibilities always exist. Neuroplasticity refers to the brain’s ability to change structurally and functionally as a result of input from the environment. This means our brains are reactive to the ways we channel our attention. For example, if we regularly channel our attention to reading, math, or playing piano, the neural areas of the brain associated with those activities become more developed and accessible, and we are more likely to develop an expertise. The same holds true for the type of thinking we do. If we are positive thinkers, then our brains become “wired” for positive thoughts and solutions. However, if we focus on negativity and limitations, then we tend to always think in negative and limiting ways. The human brain is designed for problem-solving, which is defined as the effort to overcome obstacles obstructing the path to a solution. And as you can probably guess, the more we solve problems, the more adept we become at solving future problems. Additionally, when we search for new ways around a problem, we often tap into our ability to think creatively. The moment we say, “I can’t,” we close the door on our thinking. Essentially, we give ourselves permission to retreat from a challenge. But the truth is that all possibilities exist within our thinking. In this context, “can’t” exists due to two common things: an unwillingness to search for a solution, and because we’ve trained the mind to limit itself. A primary focus of Positive Psychology is to find and nurture our strengths and talents and discover ways to make normal life more fulfilling. According to positive psychologists, our ability to experience happiness is directly linked to our ability to be optimistic. Optimism is the tendency to take a hopeful view about the future, or to have confidence in the successful outcome of an endeavor. Learned helplessness, on the other hand, occurs when one believes that they have no control over what occurs, and that something external from themselves dictates their ability to succeed or accomplish a task. Self-limiting thoughts are counterproductive to cultivating optimism. When we say, “I can’t,” we are accepting the idea that we don’t have control over our ability to accomplish something – which is not very optimistic. “I can’t” perpetuates an inner dialogue that short-circuits our goal-directed thinking because we start to believe that we don’t have the capacity (helplessness) to find a route to our desired goals. Whenever we have a feeling that we can’t do something, we should pause before we actually say it. First think about the circumstances that would make the endeavor possible, and then be honest about whether we WANT to put forth the effort to do it. It’s really a matter of overcoming our own objections. Instead of filing our hesitation under the category of “I can’t,” we should uncover the true issue. For instance, if we wish to travel the world, it’s not really rocket science. We simply have to create the proper conditions. World travel requires money, travel documents, and time. Whether we are willing to create these conditions is really a matter of “will” or “won’t,” not “can’t.” We will accumulate the money, apply for the appropriate travel documents, and schedule a time to go – or we won’t. Even if the answer ends up being “no” in the end, at least we will have explored the possibilities that exist. This allows us to see that we actually CAN accomplish this goal if we’re willing to put forth the effort to create the proper conditions. This type of dialogue can reveal a lot about who we really are. Maybe we will learn something new about our authentic selves, and it is possible to uncover a few hidden fears. “Can’t” implies a limitation that has been imposed upon us – which is disempowering. Therefore, by eliminating the word “can’t,” we are actually embracing the power to DECIDE what we truly wish to do. Whether we “will” or “won’t” means that we’ve made an empowered choice, versus reacting to an imposed prohibition. Henry Ford said it best: Whether you think you can or think you can’t – you are right. When we tell ourselves “I can’t,” it ensures that we will not even attempt – which destines those words to become a self-fulfilled prophecy. Therefore, we should eliminate the limited thinking of “I can’t” so that we can get out of our own way. Once we remove our largest obstacle, we open ourselves to the freedom of unlimited experiences and infinite possibilities. And now . . . I rest my case. What do you think your life would be like if you challenged your “I can’t” statements?